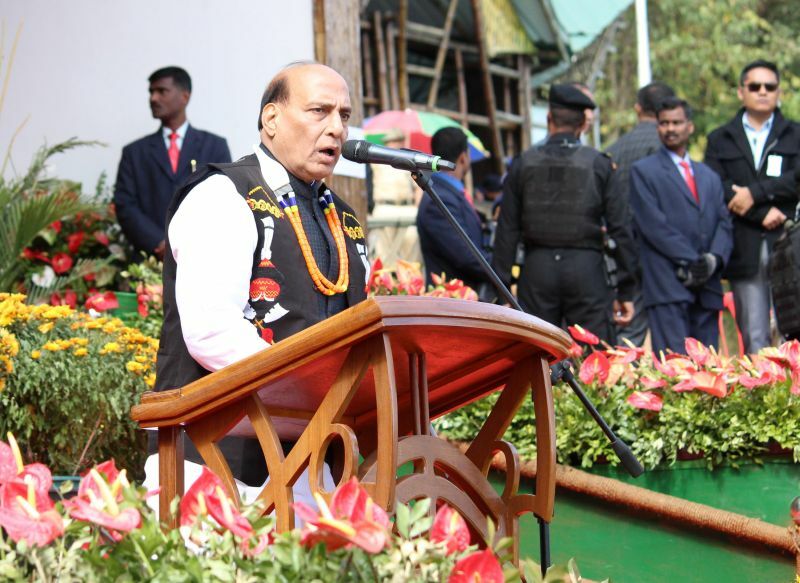 With an aim to put to rest all speculations and uneasiness doing the rounds in the states of Assam, Manipur and Arunachal Pradesh, Union Home Minister Rajnath Singh on Friday proclaimed that the territorial integrity of the three northeastern states would not be compromised while inking the final Naga peace accord. “There should be no apprehension or worry for anyone. Territorial integrity of no state will be affected,” Singh told the media. He was replying to a question about the possibility of hampering the territorial integrity of Arunachal Pradesh, Assam and Manipur by the impending peace agreement between the Central Government and Naga insurgency group NSCN-IM. The Home Minister further said the Central Government was committed to do its best to fulfill the aspirations of the Naga people for a bright future. “The Central Government, under the leadership of Prime Minister Narendra Modi, is committed to do its best to fulfill the aspirations of the Naga people for a brighter tomorrow with all the honour which they richly deserve,” Singh said at the Hornbill Festival at Naga heritage village Kisama, about 12 km from the state capital Kohima, earlier in the day. Notably, NSCN-IM’s key demand is to integrate the Naga-inhabited areas of Arunachal Pradesh, Assam and Manipur, which has been strongly opposed by the three states, currently ruled by the BJP. Last week, President Ram Nath Kovind said Nagaland was at the threshold of making history as the final agreement on the Naga political issue would soon be arrived at and a lasting peace achieved. Possibilities and aspirations for a lasting peace to the vexed Naga issue gained momentum, after the Centre and the NSCN(IM) signed a framework agreement in 2015 last. Latter addressing the jawans of the country’s oldest paramilitary force, the Assam Rifles at Shokhuvi, Singh claimed that violence inflicted by various insurgent groups in the North-east has come done significantly, ‘by 75 to 80%’.